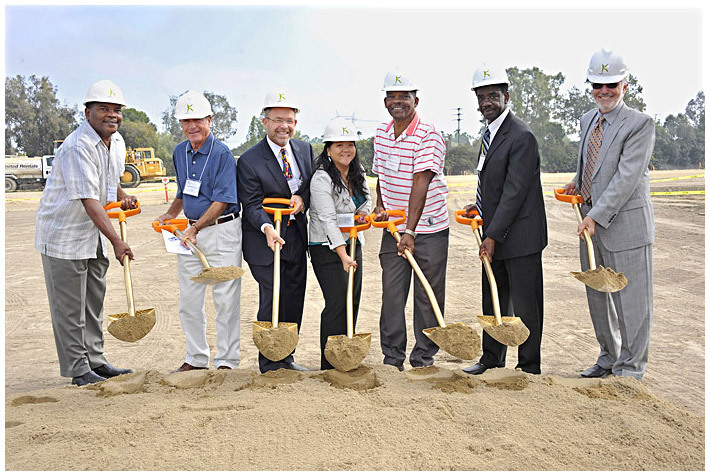 The Long Beach Unified School District officially broke ground this month on a new, $75 million high school named after local civil rights pioneer Ernest McBride, Sr.
McBride High School will serve about 1,000 students and is slated to open in fall 2013. Located on the 24 acres of East Long Beach’s former DeMille Middle School site at 7025 E. Parkcrest St., the new school is funded through Measure K school bonds approved by 71 percent of local voters in 2008. Such funds may be used only for school construction and renovation. The new school will be small compared to LBUSD’s large, comprehensive high schools that serve more than 4,000 students each. Research studies and ample feedback from parents and other community members suggested that Long Beach should create smaller high schools as part of its Facilities Master Plan. Several members of the McBride family were on hand to celebrate the groundbreaking, as was Long Beach NAACP President Naomi Rainey. The school’s namesake, Ernest McBride, Sr., co-founded the Long Beach branch of the NAACP, and though he died in 2007 at the age of 97, he left a legacy of peaceful but persistent advocacy for equal opportunity in Long Beach. His son, Ernest McBride, Jr., shared with the audience a favorite phrase that his father would likely have uttered at the groundbreaking ceremony. “I’m tickled pink,” McBride, Jr. said. When it opens in Fall 2013, McBride High will offer an innovative program of rigorous coursework focused on preparing graduates for college and careers in their choice of three high-demand fields: health and medical professions, law enforcement and legal services, and engineering. NEW SCHOOL — Breaking ground on McBride High School are Carl McBride (son of Ernest McBride, Sr.); School Board Member Jon Meyer; Superintendent Christopher J. Steinhauser; LBUSD Executive Director of Facilities Carri Matsumoto; Ernest McBride, Jr.; School Board President Felton Williams and School Board Member John McGinnis.